This IBM® Redbooks® publication gives an overview of Cloud solutions, followed by detailed information and usage scenarios for IBM CloudBurst® in a System x® environment. Cloud computing can be defined as a style of computing in which dynamically scalable resources, such as CPU, storage, or bandwidth, are provided as a service over the Internet. Cloud computing represents a massively scalable, self-service delivery model where processing, storage, networking, and applications can be accessed as services over the Internet. Enterprises can adopt cloud models to improve employee productivity, deploy new products and services faster and reduce operating costs—starting with workloads, such as development and test, virtual desktop, collaboration, and analytics. IBM provides a scalable variety of cloud solutions to meet these needs. 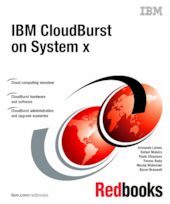 This IBM Redbooks publication helps you to tailor an IBM CloudBurst installation on System x to meet virtualized computing requirements in a private cloud environment. This book is intended for IT support personnel who are responsible for customizing IBM CloudBurst to meet business cloud computing objectives.